I'm on holiday, staying with my Uncle Tom Teo and Aunty Betty Teo in Perth, Western Australia. It's summer down here and I've been told I'm very lucky because the day temperature is very comfortable now at around 30°C; it was 10° hotter last week and scorching. The point I wish to make in this post is how blissful it is to listen to silence. 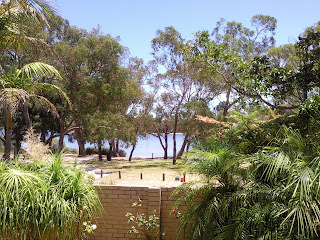 For all of us living in a busy and noisy urban environment (and Bangkok is very bad in that sense), Perth suburbs are so peaceful one can hear the wind blow in the trees, the birds singing; no honking, no aircon fans, no constant TV or radio. Unlike in other parts of Australia documented by Grant Vinning, 7.00am noisy leaf blowers do not rule the streets here. It's nearly as good as being in a country house. I slept ten hours on my first two nights here; I guess I needed them. My body now feels great and ready to enjoy the beach, riverside walks and jogs, and also lazing in the house with a book. Lesson I have learned: give my body a break from noise from time to time and listen to the sound of silence. But keep feeding myself with healthy food - no ascetic retreat for me, thank you!